Former cruiserweight champion and Sky Sports pundit Johnny Nelson has come out in defense of heavyweight contender Kubrat Pulev, who is being accused of sexual assault by a female reporter. The incident has made continued headlines after a video captured the Bulgarian boxer kissing the reporter during an interview. 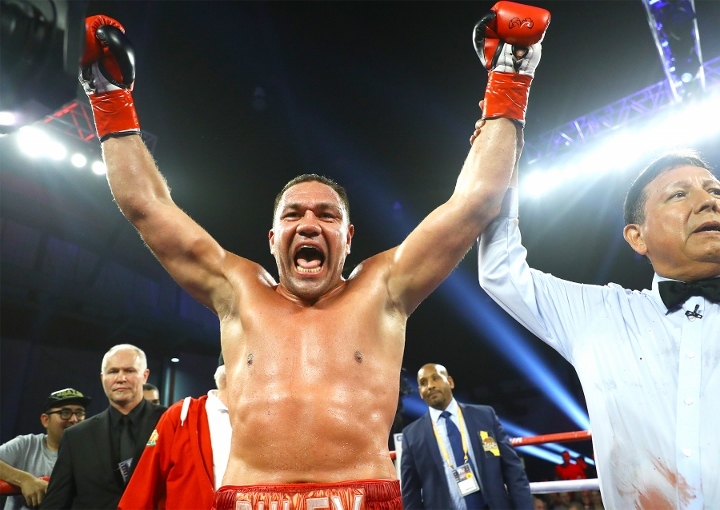 Reporter Jennifer Ravalo, also known as Jennifer SuShe, interviewed Pulev after his 27th victory in a fight against Bogdan Dinu in Costa Mesa, Calif., on March 23. After answering a question, Pulev – seemingly out of the blue – gave her a kiss. Last Thursday, Ravalo appeared with high-profile attorney Gloria Allred and called for Pulev’s license to be suspended. She also called on the California State Athletics Commission to investigate the incident. “He grabbed both of my buttocks and squeezed with both of his hands. Then he walked away without saying anything to me and laughed,” Ravalo told reporters. The reporter said Pulev invited her to a party later on where he allegedly asked her to “remove the kiss from the interview.” She said she refused to and posted it instead. The California State Athletic Commission [CSAC] suspended his license, until he appears before them to explain what happened. The next hearing is slated to for May 14 and Ravalo plans to attend. Pulev denies grabbing her buttocks and said Ravalo was clinging on to him and his team for days. There was a video already released by Pulev’s team, which showed Ravalo at the party and appearing to be in a very good mood as she sat on a team member’s lap. There were also photos of her with team members, including Pulev’s younger brother. After watching the post-party video, Nelson has doubts about Ravalo’s story of being devastated but then going to a Team Pulev after-party to celebrate his victory. “You see what you see. For women that have been sexually assaulted, like properly sexually assaulted, that lady is doing none of them any favours at all, she’s putting them back 10, 20 years,” Nelson told IFL TV. “Don’t cry wolf when the next minute you’re dancing with the wolf in his dressing room. She doesn’t seem as shocked or shook up as she’s now trying to claim she was. The main issue is going to be that there are a lot of young women trying to get into boxing so when a woman does this which clearly contradicts what they’re trying to say and do, it’s not doing females any favours whatsoever. Any judge with any common sense would say ‘get out of my courtroom’, I can’t see that anybody will sit there and say ‘yeah, you’re right girl, go for it’.